It is rich in antioxidants called polyphenols, which have been medically linked to protection against heart disease and cancer. It also contains a high concentration of epigallocatechin (EGCG) which has been shown to boost metabolism, slow the growth of cancer cells, and help support skin health. It is also a great afternoon ‘pick-me-up’ anytime you need an energy boost! If that is not enough reasons to try matcha, there are many more but I don’t want to bore you with too much science 🙂 So, time to get to my simple 10 minute recipe. • Add all the ingredients to a mixing bowl and whisk to combine. Place in a covered bowl in the fridge overnight or until it has achieved a pudding-like consistency. • The night before, chop bananas and place in the freezer overnight. 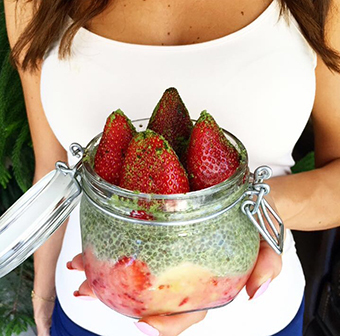 • In a blender, add frozen bananas and strawberry and blend until they reach a perfect consistency. 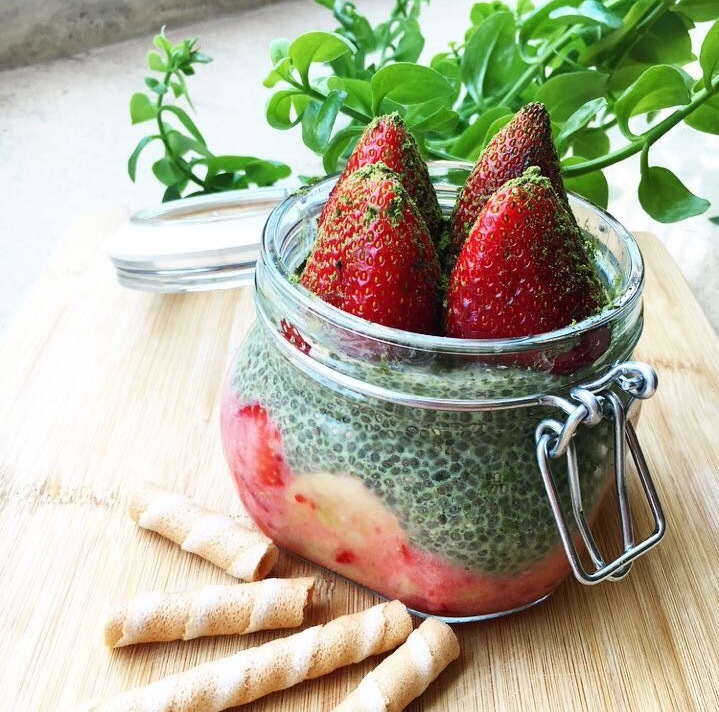 • Layer both the Vanilla Matcha Chia Pudding with Strawberry Nicecream and add any additional toppings you love, such as, coconut shavings, granola, mangoes, raspberries and many more! Try it out! Let me know your thoughts on matcha and don’t forget to tag #UrUmbrella! Sa7tein! Bon appétit! Enjoy!